Each time we wake up, we have a chance to spring forward into our destinies. Every moment is a seed of creation. It is a time of dormancy, and then we are asked to wake up and step forward once more on our path of self-mastery. We are all budding flowers, plants, growing each day evermore. We can keep creating the wilderness of our souls out onto the Earth, by spreading our wings and truly flying and embracing all of what we are. When we start, a bud in the ground, we learn how to adapt to our surroundings, and through each change or obstacle that we encounter in life, we learn from it, we grow once more, and again and again. Our lives were meant for blossoming. Our lives are seedlings of creation. We are always going to grow. We are always going change. And once we have shed the flowers of yesterday, we are born again today, to start anew, on a brand new adventure of creation. We are ceaseless. We are endless. We are effervescent in our abilities here to manifest greatness. We can always keep healing and we will keep shining our bright green super lights here. We are The Creation. We are The Source. We are ONE!!! God and Goddess Blessings to all. Peace, Namaste, Love you eternally. The flames grow. The fires are impassioned now. We rise and rise in time, aflame with a new glow, a new desire being called forth from within our souls. We cannot deny what is inside of us anymore. We are beckoned forth by this carnal pulse, this throbbing desire to awaken to our true nature, and our powerful right as Divine healers here. Awakened and breathing in such Divine white and powerful light. We are Awakened. We are Source Light. We are Truth. We are the Vision of God. We are Awake with Love now. Burning beautifully, and boldly and violetly we shine with our eternal truth here now. May you see the God/Goddess inside of you now, and Be Blessed and Awakened to your truest desires. Follow the path into the Portal of Desire and let your soul shine free! Blessed Be, Ancient Ones. Namaste. Our inner knowing stretches beyond the imagination, our imagination is only the tip of our knowingness, our deep inner wisdom, our deep healing grace. We have infinite potential to reach new landscapes, mindscapes and powers beyond time if we see that we are not limited by our sight. Our sight is beyond the physical here. We see with our inner mind, our inner heart, our inner eyes, we see beyond time when we go within and when we choose to liberate ourselves from the constructs of time and this world therein. So when we choose to see beyond the limitations that have been set up by others or by ourselves, we can see that all is known and all is infinite. Everything we could ever want to know is right there for us, just waiting for us to tap into with our minds, hearts, bodies and souls - our ALL. Our entire being and consciousness is present to this awakening, so when the Eye Opens to a New Day, a brand new day, it is asking us to once more go within, find our second sight, third sight, fourth sight and beyond and see into the visions of time, past our own awakening, going further and further into the collective consciousness's awakening and allowing ourselves to open up to such visions of grand scale and scape that we will truly know within the very depths of our beingness that we are not limited, we are infinite, we are more than capable and we are risen, as well. Blessings to all and have a peaceful day as you look upon each other with brand new vision, sight, awakening and eyes wide open. Peace be with you. Namaste. I received a vision of my friend, Asta, during one of my peaceful meditative walks in nature. Her face and eyes were clear, and upon returning from that walk, I immediately set about this piece. It contains the channeled energy that we all possess as divine creators on this earth. We have so much heritage in our soul to help align us to the truest of paths, deep in our hearts. 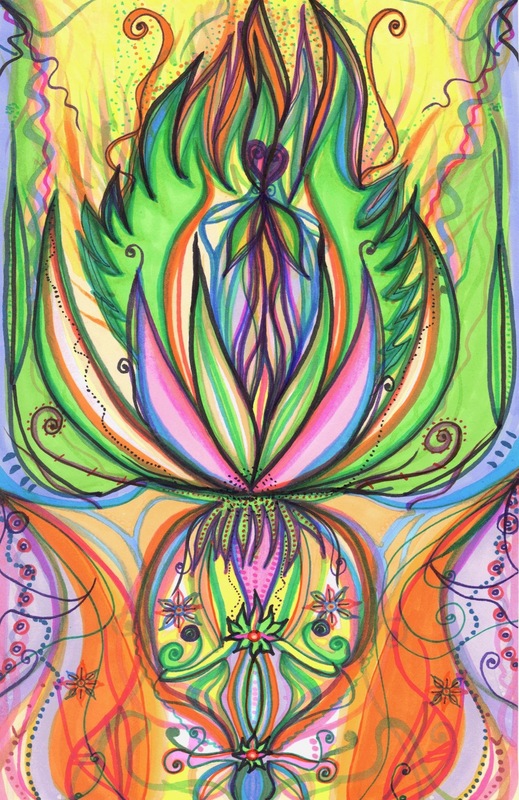 I hope as you reflect upon this piece, you can see yourself in it as well, for We are Truly One Divine Being, One Consciousness here, living out many different unique experiences and perspectives. It’s all truly a beautiful thing to be alive on the earth at this time. Have a blessed day. Namaste. Peace. xoxo. LOVE!